Analyst George Crump outlines the benefits and drawbacks of converged and hyper-converged architectures to help first-time buyers select the most effective system. Convergence is the prepackaging or collapsing of multiple tiers within the data center -- typically compute, networking and storage -- into a single unit. The goal of a converged architecture is to simplify IT and improve the time to value, which appeals to overworked and understaffed data centers. But part of the challenge with adopting a converged vs. hyper-converged system is getting the timing right. With the exception of the software-only model, an organization needs to replace or significantly add to its server population to implement convergence. The first step toward convergence could also be a new project, where the turnkey nature of the platform allows for a faster time to value. The converged and hyper-converged market was nonexistent five years ago. Now it often overwhelms IT professionals with choices. Selecting a system from the right category is critical for IT planners, so they can complement existing IT investments and meet the long-term goals of the organization. The first step is to decide whether a converged vs. hyper-converged infrastructure will work best for your environment. 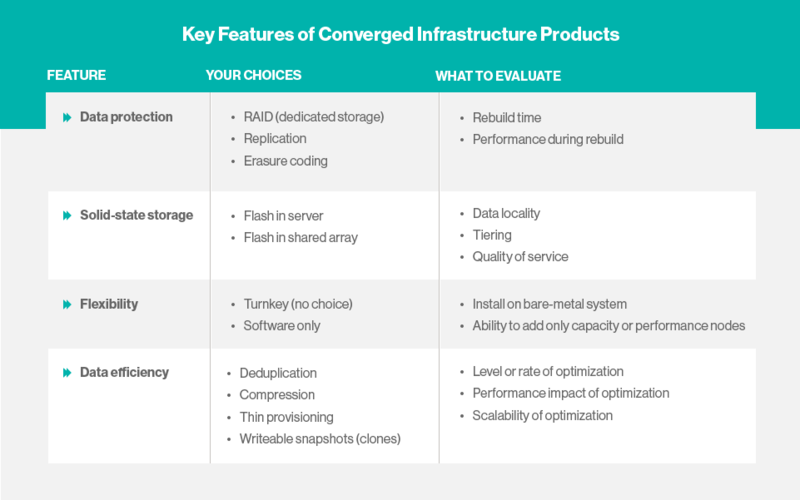 Converged architectures prepackage the three tiers, but use discrete components that are typically from separate manufacturers. These products are usually pre-integrated and, in theory, all an IT administrator has to do is plug them in and begin installing applications or creating virtual machines (VMs). A converged system is very complementary to an existing architecture. It is, after all, built of similar, if not identical, parts. These products can be more granularly fine-tuned since each tier is still a separate component. If more storage performance or capacity is necessary, an administrator can add it without upgrading CPU performance, as is often required with hyper-converged systems. There are several converged architectures that are not prepackaged. These are reference architectures an IT professional or designated reseller uses to implement the system. These systems provide greater flexibility in terms of mixing and matching hardware, but reintroduce the difficulty of installation. Reference architecture providers typically offer an installation guide that should make it easier to implement. They also have agreed to provide seamless technical support among the components, which should reduce any discussion between vendors and customers as to who is to blame for a possible failure during installation. Converged systems and converged reference architectures come in a variety of configurations. Some are all-flash, others take a hybrid approach with both hard disk and flash. Because the storage layer is still a separate tier, there is no difference between evaluating a storage system intended for a converged architecture and one that is not converged. The pros and cons of a hybrid versus an all-flash system are the same in a converged environment as in a traditional data center. Hyper-converged architectures are often less expensive and less complex to deploy. When weighing the converged vs. hyper-converged equation, hyper-converged systems are easier to operate since storage, compute and network management are integrated. Hyper-converged systems scale easily. When additional compute or storage performance is necessary, all an IT professional needs to do is install another node to add resources to the cluster. It may be more restrictive to hardware selection. Unlike typical converged architectures, some hyper-converged systems require an organization to purchase all the hardware and software together and expect the nodes within that cluster to be identical. This limits the flexibility of the system during an upgrade or expansion. It can also be difficult to just scale one component of the hyper-converged architecture, as a node comes with additional compute, storage and networking. It is sometimes difficult to guarantee precise levels of performance to specific applications. The difficulty in ensuring quality of service stems from the reality that hyper-converged architectures are "shared everything" environments. The same compute that powers the hypervisor also drives the application the hypervisor runs on, as well as the storage software services that can be demanding in their own right. Unlike converged systems, hyper-converged systems change the way storage is managed. One of the core requirements of any storage infrastructure that supports a virtual environment is that it needs to provide shared access to a VM's data store. That is necessary for the VM to migrate between hosts. Hyper-converged systems do this by aggregating the storage within the hosts, creating a virtual volume. The virtual volume typically leverages some form of replication or parity-based protection to protect the data from a drive or node failure. The storage in the host can be flash or hard disks. the path for your firm? Some hyper-converged systems leverage flash to create two tiers of storage. The flash in the host stores VM data currently active on that host, and then a copy is made to an aggregated (virtual volume) HDD tier for VM mobility and data protection. The advantage of this approach is that VM storage performance is at flash speeds and provides lower network latency since most of the data is local to that host. The appliance approach: The entire system, hardware and software, is delivered as a single unit. The bundling may simply be a matter of convenience for the customer and vendor, simplifying support and easing implementation. It may also be a requirement. The vendor's design may require every node in the cluster to be identical, so it only makes sense for them to deliver the nodes. Software-only: The vendor delivers the software and lets the customer select the server hardware of his or her choice. This option provides the most flexibility in terms of hardware selection. It also typically is the least expensive because organizations can leverage existing hardware or purchase new hardware from competitive sources. On the downside, a software-only design requires more upfront planning and potentially a longer implementation process. Hypervisor flexibility should also be considered when evaluating potential converged and hyper-converged platforms. Most converged systems, because they are software with prepackaged hardware, can operate with a variety of hypervisors. But again, because a converged infrastructure tries to speed up implementation, it often pre-implements the hypervisor with the hardware. The result is a converged system that may not be as flexible as it appears. Hyper-converged appliances are similar in this regard. Most hyper-converged vendors write their software to support a variety of hypervisors. But because the hypervisor is often pre-implemented with the hardware, a customer needs to make their selection upfront. Hyper-converged software vendors will also support multiple hypervisors, but since there is no pre-integration with hardware, a customer has greater flexibility. There are also hyper-converged vendors that don't leverage a top-selling hypervisor. Instead they use a less-expensive, open source -- typically Linux-based -- hypervisor. While often not as feature-rich, these hypervisors are just as reliable. The advantage is that a hyper-converged vendor now has greater control over how the hypervisor integrates with its hardware and it doesn't have to pay the licensing fee required by the top-tier hypervisor software vendors. The result should be a more-customized, less-expensive system. While custom hypervisor hyper-converged systems may not have the third-party support of top-tier hypervisors, they may be ideal for small and medium-sized organizations that don't have a large investment in a particular virtualization hypervisor. Software-defined technology sizzles; where's the beef? Converged vs. hyper-converged landscape: What does it mean? How does converged infrastructure management affect IT? How will the hyper-converged data center affect storage admin roles? What were the biggest factors contributing to your final converged infrastructure decision?